Story: The Flaw: Markets, Money, Mortgages and the Great American Meltdown. What caused the world's biggest economy to crash and burn? And why is it so slow to recover? This documentary tells the story of the credit bubble that caused the financial crash. 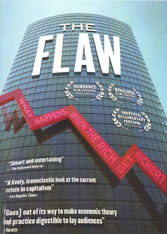 It includes interviews from leading economists, housing experts, Wall Street insiders and victims of the crash. At a time when economic theory and public policy is being re-examined, this documentary reminds us that we need to address root causes, lest it happen again. Note 1: I highly recommend that English-learners read the following notes and quotes before you watch this film. Some/many of these words will be unfamiliar, so be sure you understand them before you watch! R Shiller, Yale University Prof. of Economics. Sort of summarizing: It's a crisis of wealth, of debt, of economic theory; it's a total failure of markets. The crisis was caused (in large part) because banks (including “the Central Bank”/Greenspan) encouraged us to borrow and spend more and more (for decades). This “encouragement” benefited those who own things already (the rich). Greenspan believed that the financial system was a self-stabilizing system. He didn't see the need to influence maximum prices, but felt that the Board should keep prices from dropping too much (by encouraging people to borrow more and buy more). 3. Prof Shiller (Yale) explains the crisis in cultural, not economic, terms. Capitalism became prominent under Pres. Reagan/Prime Minister Margaret Thatcher, then it moved on with the break up of the Soviet Union (USSR), and the advent of capitalism in China. It was an intellectual revolution: people believed in markets, and thus that “private property reigns.” This caused fear in those who didn't “own” anything (property or stocks), and thus they felt they needed to become “investors” (even though they didn't know how to invest). They “bought internet companies” (stock), but they were then embarrassed when the stock market bubble burst, and turned to physical property (real estate). The 1950s was also the time when there was the least “income inequality” in US history (i.e., the smallest gap between rich and poor). In 1929, the top 1% earned 22% of the income. Inequality fell until the 1970s, when the top 1% were getting only 9%. The gap widened in the 80s and 90s. By 2007, the top 1% were getting about 25% of the total income. These ultra-rich people, once they spend millions on themselves, have billions more to invest in financial assets, which tends to ignite asset bubbles. Furthermore, as the rich build bigger houses, this trickles down to all levels (e.g., in 1970, the “median family” wanted a 1600 sq foot “median house”; now they want 2400 sq feet). Though bigger houses cost more, people sacrifice (other budget needs) to live in a “nice neighborhood,” in part because schools are funded by local property taxes, so there's a strong link between how good the schools are in an area, and how much the houses cost. Two other important economic factors are the rise of globalism and the de-industrialization of America, starting in the 1970s but escalating in the 90s. Although workers' wages were stagnant (didn't change), prices kept rising. To keep up their standard of living, people went deeper into debt. When American factories were busy (1950s/60s), unionized workers could strike for better wages and benefits. But as many jobs “went overseas,” union power decreased and workers “took what they could get” (for even low wages were better than no wages). 6. Part of what caused the Great Depression (1929+) was not only that people lost their jobs, but that investors fled the mortgage investment market. To solve this problem, a federal program was created (FHA) that made it easier for investors to buy and sell mortgages (i.e., to treat mortgage loans as assets). Meanwhile, criteria was set for “a good loan”, including “no class or race mixing in a neighborhood.” This, in turn, lead to the creation of both “middle class suburbs” and “the lower-income ghetto.” Investment money went to the suburbs, and the inner-cities deteriorated. Then, in the mid 1990s, credit money started to flood into the inner cities. This investment money (for mortgages) came from the ultra rich, those “newly rich” because of the bubble (i.e., there was so much money being made that they were looking for new places to invest it), as well as investment money from China and other places overseas. CDOs. Banks didn't want to “hold” mortgages for the full 30-years of the loan, and someone created CDOs (Collateralized Debt Obligations)--a group of mortgages or credit-card loans (grouped according to the borrower's “risk of bankruptcy” factor), sold into the Wall Street capital markets as “assets” (and later called “toxic assets”). 7. To illustrate how easy it was to borrow money (at the height of the bubble), one man said he didn't even have to disclose (tell the bank) what his income/pay was. They didn't care, as long as he had a job and the house was worth the amount of the loan. He said he wasn't buying an investment; for him, it represented “normalcy” after a traumatic divorce and remarriage; it was a “ticket to continued membership in the middle class” (a place for his family, school for the children, etc.). A woman wanted to expand her business, and banks kept telling her she needed a house for collateral (i.e., they said that if you are paying the mortgage for a house, it will be easier to borrow money for your business). Bankers talked her into buying an expensive duplex (two houses under one roof), and said that those who rent the other part will be helping her pay for her part, and that “after a year you can refinance the mortgage and get lower payments.” But “refinancing” costs the borrower money (up front—in the beginning), and many people (especially minorities) were pressured (lied to?) into getting mortgages that they couldn't afford (because the “loaner” would make money up front, and then sell the mortgage to Wall Street investors, via CDOs). Some called this “predatory lending” (a “predator” is a big animal who lives by killing/eating weaker animals, like a lion who kills an injured zebra). Unfortunately for this woman, “a year later” was after the bubble burst, and no one allowed her to refinance because the “value of the house went down.” Then she tried to get a “loan modification” but it was denied “because you've been paying your mortgage on time” (i.e., she had been honoring her agreement with the bank!). But even after she stopped paying on time, the loan was denied. She is now stuck with a mortgage she can't afford. In Miami, investors and builders constructed large high-rise blocks of homes (because they were not expensive to build, but could be sold for a lot of money). Then the bubble burst. Many of these houses have remained empty (“...there's 400 units and there's 50 people in it right now...”). To explain, a man said: “Banks get the financing to build, so they have to keep building” (regardless of whether anyone want to buy the homes or not). A banker said that, not only was he making a million dollars per year, but when they helped people refinance, those people were extremely grateful that we had “saved” their home, “so we felt like we were helping people. It seemed like win-win for everybody.” But after the bubble burst, lots of people lost their homes and savings. 9. As the bubble grew, investors knew the simple math: a dollar put into home mortgages, makes you more money than a dollar invested in a factory. The meltdown happened very quickly. Sophisticated investors (i.e., those who manage the wealth of the very rich) saw the first signs when large numbers of people couldn't pay their mortgage for three months in a row. Although financial “experts” on TV kept saying things are “OK” (to the common investor), banks “lowered the ratings on hundred of sub-prime mortgage-backed securities.” “Investors knew that the game was up” (due to these “downgrades”) and “they now knew that all of the other securities couldn't hold up either, [...so] they bailed out very, very quickly.” By the time others caught on, there was no way to get out (no one would buy the “assets” you needed to sell). J Stiglitz (Nobel Prize for Economics) says, “What we are doing in effect is transferring money from people who would spend it, to people who don't need all that money and don't spend it.... When you have growing inequality, typically, your level of consumption goes down...” (and telling normal people to 'continue to spend, using borrowed money' is a broken model). Compare the situation described in this documentary with conditions in China. In particular, comment on bank interest rates, stock market values, housing prices, etc. Where do "smart investors" put their money? How do cultural values help keep the demand up for housing? (Marriage? Family pressure? Others?) Compare the cost of renting with the cost of buying (remember that in China, you are really only leasing the land for a period of years, not buying the land). How long do you think housing prices continue to climb, and to what level? What are some of the crucial differences between China and American (related to these issues)? Do you think that Ms. Minow's comment applies to the situation in China? Why or why not? I see a lot of empty apartments around Xiamen, with more under construction. Who is building them, and why? Many Chinese investors are also buying property abroad. Can foreigners participate as easily in China's economy? What do you think of this? If you had money to invest today, where would you invest it, and why? The banker in Miami said he thought he was helping people, but later realized that he was part of the reason why so many people lost their homes and savings. Tell your partner about a time when someone thought they were helping you (or sb else), but actually were not. A lot was said about debt, and the problems caused by people borrowing money (on credit cards, as well as through mortgages). How do you feel about “borrowing money”? Who would you borrow from, and how much might you be willing to borrow? Give your partner some advice about using a credit card or other forms of credit. The picture shows blocks that represent main values; they say: Privacy in the home, Right to own property, Religious freedom.